FX has picked up Mayans MC to series, ordering a 10-episode first season of the new drama series from Kurt Sutter and Elgin James, it was announced today by Nick Grad and Eric Schrier, Presidents of Original Programming for FX Networks and FX Productions. The first season of this Sons of Anarchy spin-off will premiere on FX in 2018. Here's what Nick Grad had to say about the new series in a statement. "Kurt Sutter is a master storyteller and Mayans MC has the raw energy and intensity that are hallmarks of his signature style. Thanks to Kurt, co-creator Elgin James and this amazing cast, Mayans MC builds on the legacy of Sons of Anarchy, taking it in a thrilling new direction that we can't wait for the world to see." Mayans MC is the next chapter in the Sons of Anarchy saga, Kurt Sutter's award-winning series that was the highest-rated ongoing drama series in FX history for seven seasons. 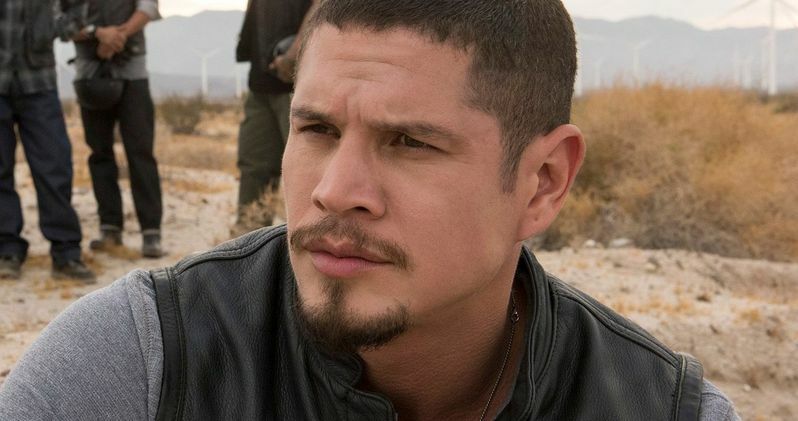 The Mayans were recurring and pivotal players in Sons of Anarchy throughout the show's seven-year run. Mayans MC is set in a post Jax Teller world, where EZ Reyes, fresh out of prison, is a prospect in the Mayan MC charter on the Cali/Mexi border. Now EZ must carve out his new outlaw identity in a town where he once was the golden boy who had the American Dream within his grasp. We reported in July that the Mayans MC pilot was re-casting before shooting a new pilot episode. Mayans MC stars Edward James Olmos, JD Pardo, Sarah Bolger, Clayton Cardenas, Richard Cabral, Michael Irby, Raoul Trujillo, Antonio Jaramillo and Carla Baratta. Michael Irby was cast as Obispo "Bishop" Losa in October, a character who wasn't in the original incarnation of the pilot episode. Bishop is the president of Mayans MC's Santo Padre Charter, who comes from a broken home in the Salton Sea. He was taken in by the family of his cousin, Marcus Alvarez (Emilio Rivera), Mayan MC founder and National President. After a tour of duty in Iraq and one in Pelican Bay, Bishop was sent by Alvarez to set up and run the critical Mexi-Cali border charter. He is as deadly as he is loyal. The original Sons of Anarchy also took a similar route, with the show's original pilot featuring Scott Glenn as the iconic Clay Morrow character, with Ron Perlman taking over the character for the re-shot pilot episode. Noberto Barba directed the pilot and will be an Executive Producer, with Sutter serving as Executive Producer and James serving as Co-Executive Producer. Mayans MC is produced by Fox 21 Television Studios and FX Productions. There has been no indication as to when production may begin on the FX Networks series, or when in 2018 the show may debut. FX is the flagship general entertainment basic cable channel of FX Networks, a business unit of 21st Century Fox. Launched in June of 1994, FX is carried in 91 million homes. The diverse schedule features a growing roster of critically-acclaimed and award-winning hit dramas series, including The Americans, Taboo, Legion, Snowfall and the upcoming Trust; the critically-acclaimed limited series American Horror Story, Fargo, American Crime Story and FEUD; acclaimed hit comedy series including Atlanta, Baskets and Better Things; and the upcoming dance musical series Pose. FX is the former home of the critically-acclaimed and award-winning hit drama series The Shield, Nip/Tuck, Rescue Me, Damages, Sons of Anarchy and Justified. The network's library of acquired box-office hit movies is unmatched by any ad-supported television network.